With U.S. carbon dioxide emissions from fossil fuel combustion currently (2016) hovering at around 5 billion metric tons a year, even a midrange carbon tax of $50 per metric ton would generate on the order of $250 billion in annual revenue. The sheer magnitude of this figure highlights the importance of designing and implementing a carbon tax carefully and skillfully. Table 1 from Jan. 2017 Treasury Dept report noted in text. Unsurprisingly, this subject has spawned a robust literature. Below, we summarize two excellent resources, from 2009 and 2015, written by some of the pre-eminent experts in carbon tax policy and economics. In addition, we just (Jan. 2017) received a new report by the U.S. Treasury’s Office of Tax Analysis, Methodology for Analyzing a Carbon Tax. The Treasury Dept report is a superb and mercifully brief (28 pages) guide to the nuts and bolts of administering a carbon tax. The table at left is indicative of the detail in the report. We suggest that readers start here. We consider the design of a tax on greenhouse gas emissions for the United States. We consider three major issues: the tax rate (including the use of the revenues and rate changes over time), the optimal tax base, and international trade concerns. We show that a well-designed carbon tax can capture about 80% of U.S. emissions by taxing only a few thousand taxpayers, and almost 90% with a modest additional cost. We recommend full or partial delegation of rate setting authority to an agency to ensure that rates reflect current information about the costs of carbon emissions and abatement. Adjustments should be made to the income tax to ensure that a carbon tax is revenue neutral and distributionally neutral. Finally, we propose an origin-basis system for trade with countries that have an adequate carbon tax, and a system of border taxes for imports from countries without a carbon tax. We suggest a system that imposes presumptive border tax adjustments, but allows an individual firm to prove that a different rate should apply. The presumptive tax could be based on average emissions for production of the item by either the exporting country or the importing country. What’s the best way to design a carbon tax? Brad Plumer (Washington Post, 3/13/12). Putting a Price on Carbon, A Handbook for U.S. Policymakers (World Resources Institute, 2015). Taxing Carbon: What, Why, and How (Tax Policy Center, Urban Institute & Brookings Institution, 2015). Finally, the excerpts below from a 2007 memo from CTC to a House Ways & Means Committee member setting parameters for administering a federal carbon tax may be helpful. We propose to tax fuels as far upstream as practicable, i.e., at the point where possession of the carbon-bearing fuel passes from the “producer” (e.g., coal mine; oil wellhead or tanker; gas wellhead) to the immediate next entity in the supply chain (e.g., coal shipper or utility; oil refiner or importer; natural gas pipeline). Presumably, each such transfer will be codified in a contract, or at least a bill of lading, specifying the attributes of the fuel. This will minimize the number of points in the economy at which the tax would be levied. It will also simplify tax treatment of potential downstream carbon control technologies such as CCS (coal capture and sequestration), as discussed below. The tax rates will be stated in dollars per million Btu of heat content for each fuel. A more familiar approach based on physical quantities of fuel isn’t tenable, due to wide natural variations in carbon content within each fuel type. These variations are most stark for coal. A ton of lignite typically contains around 40% less carbon than a typical ton of bituminous coal, for example. To tax the two respective tons at the same dollar rate would be grossly unfair since combustion of the lignite ton releases 40% less carbon into the atmosphere than for the bituminous ton. Actual disparities would be even more pervasive and pronounced on account of variations in carbon content per ton within each major coal category (bituminous, subbituminous and lignite). Fortunately, variations in carbon content of coals correspond fairly closely to variations in Btu content. This isn’t surprising, since it is the combustion of carbon into carbon dioxide that produces almost all of the heat energy released by burning any type of coal. Thus, lignite and bituminous coal differ by only 5% on average in carbon content per million Btu; differences in carbon per Btu among different batches of coals within the same category are probably less still. Our approach, therefore, is to specify standard (and slightly different) tax rates for the three categories — bituminous, subbituminous and lignite — and to offer coal purchasers the option of applying for a lower tax rate than given in the standard schedule, on the basis of a coal assay performed and substantiated by a licensed, bonded entity, subject to random spot checks for accuracy. Taxing the carbon content of petroleum presents a different set of issues because of the dozen or more different petroleum products, each of which has its own carbon profile. For example, a barrel of residual fuel oil contains roughly 15% more carbon than a barrel of gasoline. This variability can be circumvented by (i) expressing the carbon tax for petroleum in the same terms as the tax for coal, i.e., in dollars per million Btu of heat content, and (ii) levying the carbon tax on crude oil as possession passes from the producer to the refiner or pipeline. (Where one company owns both entities in the transaction, the tax can be charged at the point of transfer from the producing “business unit” tothe refining or pipeline “arm.”) This approach has the added virtue of maximizing incentives to refrain from flaring and venting of carbon-bearing gases and liquids and thus to maximize energy outputs per unit of carbon emitted. The assay option noted above for coal, whereby coal purchasers could apply for a lower tax rate on the basis of a certified assay, and again subject to random spot checks for accuracy, would also be available to oil pipelines and refiners. Natural gas exhibits little variability in carbon content per million Btu of heat content, and thus one figure should suffice, with the assay option still available to cover special cases. [We will check to ensure that LNG arriving by tanker has the same carbon-to-energy ratio.] The tax would be charged at the wellhead in order to maximize incentives to refrain from flaring. * It provides fair and workable treatment of “partial combustion” which will vary by user and use (e.g., unburned coal in ash that is returned to the mine for underground disposal; possibly also cement manufacturing, and plastics manufacture). * It creates positive incentives to minimize emissions. * It puts the burden on the fuel producer to demonstrate emissions avoidance (as opposed to a partial tax which allows the producer to reduce taxes unilaterally and burdens the government with substantiating a rebuttal case). Procedures for producer documentation of CO2 avoidance and/or sequestration will be spelled out in the next iteration of this memo. 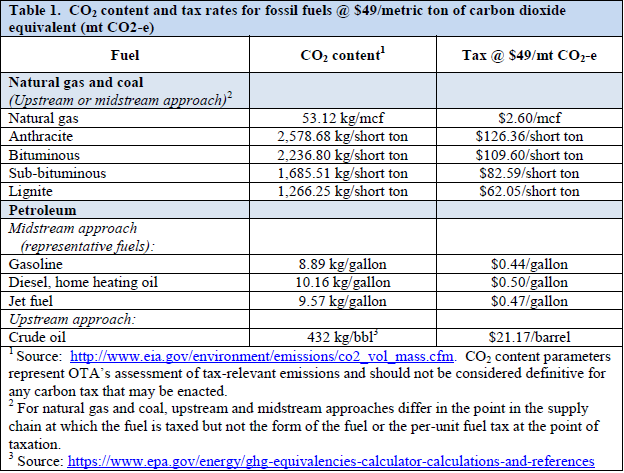 Following are tax rates consistent with charging $50.00 per ton of carbon (not carbon dioxide) emitted. Consistent with the intent of phasing this level in over a five-year period, the rates for years 1 through 4 would be calculated by multiplying the rates in the table by 20%, 40%, 60% and 80%, respectively. These amounts are derived in a spreadsheet developed by Charles Komanoff. All rates are expressed in dollars per million Btu of fuel.